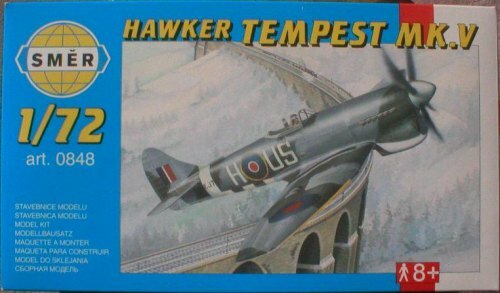 The Hawker Tempest was the evolution of Hawker’s earlier Typhoon, itself an evolution of the Hurricane. The Typhoon suffered from some severe aerodynamic problems (compressibility) at high speeds due to it’s thick wing, as well as suffering from other gremlins. The Tempest was a refined Typhoon with a completely re-designed wing of near elliptical plan form and of much thinner profile, improving the high-speed handling characteristics, and giving the aircraft a higher performance overall. The only problem with the thinner wing was that it had a lower fuel capacity, so the forward fuselage was extended to make room for an extra fuel tank between the cockpit and t he engine firewall, thus restoring the fuel capacity to the same level as in the Typhoon. This meant increasing the area of the tailfin to compensate for the extra mass up front, resulting in the leading edge extension which gave the Tempest’s tailfin it’s characteristic profile. Although originally intended to be powered by the new Bristol Centaurus radial, this engine was unavailable in quantity and Hawker decided to put this version, the Mk.II, on hold whilst putting the aircraft into production as the Mk.V with the Napier Sabre 24 cylinder inline engine, as on the earlier Typhoon. The Tempest Mk.V entered RAF service in the early summer of 1944, and it was to play a key part in the remaining months of the war, performing such roles as fighter, fighter- bomber & V1 interceptor. It was the fastest prop-driven fighter in RAF service at the time, particularly at low level, and found it’s niche intercepting low-level ‘tip and run’ raiders, V1 ‘Doodlebugs’ and the aircraft also successfully engaged German jets on a number of occasions. The last RAF examples served as Target Tugs and were retired in the 1950’s. This kit was first released by Heller way back in the 1970’s, and in many ways it shows! 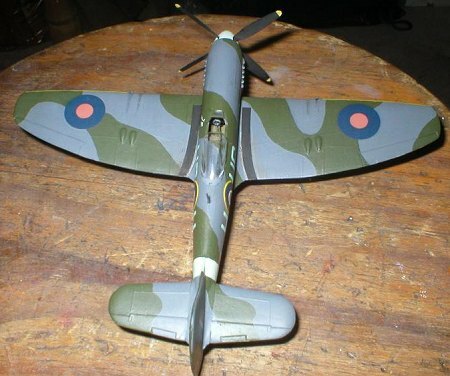 The kit is moulded in light grey plastic, with five clear parts-windscreen, canopy, gunsight and underwing landing lamps. Panel lines are raised as you would expect on a model of this age, but thankfully quite subtle, perhaps a reflection of the mould’s age than anything else! Despite it’s age, the kit appears to be accurate in overall size and shape. My kit was the standard one, but it is now also available with etched metal detail parts, which would be useful in many respects (more on that later). Two decal options are provided, Roland Beamont’s JN751 ‘R-B’ and EJ743 ‘US-H’ of 56 Sqn flown by Flt.Sgt McKennaugh in 1944. Well, what is there to say?! The cockpit consists of four parts- seat, control column, backplate and the cockpit floor. An instrument panel of sorts is provided, although it is not of the best detail or fit, although it’s very difficult to see in the finished kit anyway. Needless to say, it looks a little bare! My original intention was to pose the aircraft on a stand in a flying pose with canopy shut, and so I didn’t care too much about cockpit detail at the time. The cockpit floor, seat and control column were painted with Humbrol 53 Gun Metal whilst the instrument panel was painted 33 Matt Black and the rest of the interior 155 Olive Drab. One of the key features of the Sabre-powered Tempests and Typhoons was the enormous housing for the radiator under the nose. The radiator in the kit is built up from two pieces and is surprisingly well detailed, and looks superb when painted up in Gun Metal. This is a bit difficult to position correctly because there are no extrusions on the inside face of the fuselage to guide you, but after a bit of dry-fitting you can get the position right for yourself. The cockpit can go in when the fuselage halves go together as the instructions suggest, but it will also drop in from underneath when the fuselage is together, as I discovered. The fuselage halves match basically, but the join has various gaps and ridges that need scraping, sanding and filling. If you build the model with undercarriage down, it might also be an idea to cut out the radiator exit flap at the back of the radiator housing so that it can be replaced with a piece of plasticard and posed in the open position later. At the time, I was still aiming to build the model in a flying pose, so didn’t give it much thought. The wings are built up in three main parts, a one-piece lower surface and the two upper surfaces. Having inserted the clear landing lamps, the wing is glued together with some care- there are no pins or sockets so the whole thing has to be judged by eye. The join between wing and fuselage is not the most comfortable fit. A bit of filing here and there and a bit of pressure whilst the glue (Revell Contacta) dried soon sorted that out, and with a bit of sanding the join with the underfuselage was blended in perfectly. Not so the wing roots! The gap in the left wing root was soon sorted by inserting glue into the joint, but the one on the right was far more substantial and had to be filled with Revell’s Plasto filler. This is a surprisingly awkward place to sand, and some care had to be taken when smoothing the joint so as not to damage the fuselage sides. Each tailplane is moulded in one piece and it’s simply a matter of removing them from the sprue and gluing them in place. The fit is snug with no need for filler. This was the bit of the kit I hadn’t planned to use, however I was a bit pushed for time and patience and decided it was too much trouble to make a stand for the model. The undercarriage bays are moulded into the undersurface of the wings, and have exaggerated detail. This is difficult to remedy because of the bays’ recessed position, so I decided to leave it as it was. One of the sockets for the undercarriage legs was not well moulded, and I managed to damage it in my attempt to drill the required hole in it. This caused a slight problem when fitting the leg, but the undamaged socket was an excellent fit, so as long as everything is moulded properly, it should be fine on other kits.The bays were painted Matt Olive, although some later research shows they should probably have been silver. Legs were painted With Humbrol 33 Matt Black and acrylic Silver. My only complaint about the undercarriage is how flimsy it is. The model wobbled as though it were sitting on a jelly, and it needs the undercarriage doors to give the legs re-enforcement. This is where the metal parts of the newer kit will be useful to strengthen the legs. The tailwheel and oleo come as one nicely moulded piece, and this goes on with no fuss. Mainwheel and tailwheel bay doors are best left off until final detailing. I decided to finish the model as EJ743 ‘US-H’ of 56Sqn. The paintjob for both options is identical. I used Humbrol 27 Matt Sea Grey and Revell 68 Dark Green for the topsurfaces and Humbrol 64 Matt Light Grey for the undersurfaces. 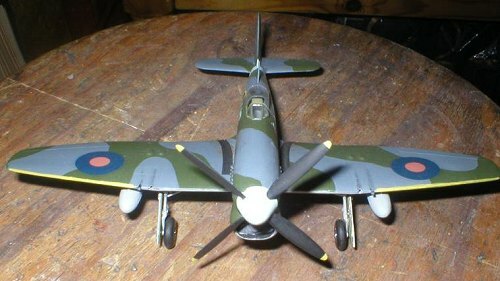 Wing leading edges and propeller tips were painted with Humbrol 24 Trainer Yellow, whilst the spinner and rear fuselage band were 23 Matt Duck Egg Green. Exhausts are Gun Metal. I am one of what seems to be a dwindling number or modellers who doesn’t own an airbrush, so everything you see is hand-painted. I then applied a coat of Humbrol 135 Satin and applied the decals. The decals are nicely printed and have good register. The only problem was that the red centre to the underwing roundels was slightly off-centre, but I can live with it. The decal invasion stripes are a little too wide so it’s necessary to trim two or three millimetres off each edge so that the stripes wont go too far up the fuselage sides. With decals done, I applied some of the final details such as the canopy, pitot probe etc. I then gave the whole model a coat of Humbrol 49 Matt Clear, and then another coat of Satin. Exhaust stains and other weathering were applied in artist’s acrylics and watercolours, along with the wing tip navigation lights. 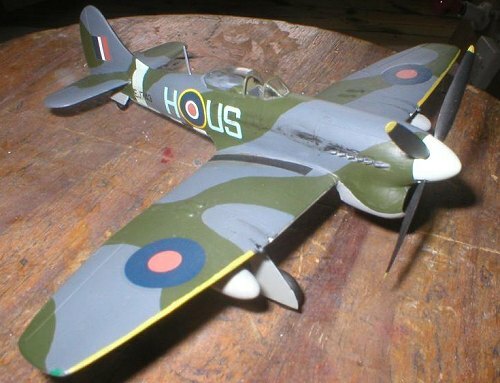 Ok, so this is NOT the best-moulded or most detailed kit on the market, but it is good value for money and what you get is a good representation of the Hawker Tempest for less than half the price of the Academy kit, and that kit still has one or two faults. Overall, I enjoyed this kit very much, largely because I didn’t pay much for it and so didn’t take it too seriously. All in all I’m happy with it. If you decide to build a more serious model of the Tempest, then it might be a good idea to buy the Academy kit AND the SMER kit, and combine the best features of both. The propeller and the wheels of the SMER kit look to be more accurate than those on the Academy model.